Rangam's husband passed away many years ago due to tuberculosis. The couple had six children, and after her husband's death, Rangam struggled to provide for her family. Five of her children are now married and all but one have moved far away from Rangam. 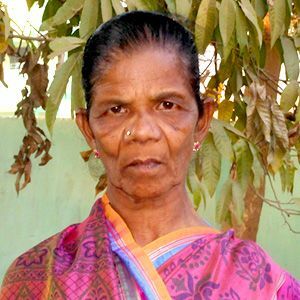 Sadly, her youngest son, who is not married, began suffering from mental health issues and destroyed Rangam's home. She now lives all alone in a very small hut and struggles to provide for herself. Please consider supporting Rangam so that she doesn't have to wonder if her needs will be met.